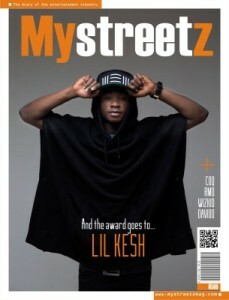 Talented singer, Lil Kesh, is the cover for the latest edition of Mystreetz Magazine. The YBNL act, was basically chosen as the cover for his immense talent. There have been quite a few moments that stood out in the history of the Nigerian music industry but none gathered more conversations and created solutions to several nagging questions like the moment after the winner was announced during the 2015 Headies. While several media outlets jumped on the bandwagon to elaborate on whoâ€™s right, whoâ€™s wrong, who dissed the most and who deserved to win the award, we at Mystreetz Magazine took a different outlook to what that moment uncovered. That moment goes beyond who won and who did not. That moment revealed to us that the Nigerian music industry has transformed to a huge global village with unprecedented numbers of followers exchanging conversation in supersonic speed. It was also an indication that the â€˜Streetsâ€™ have become the major yardstick dictating who becomes endorsed, which artistesâ€™ caller tunes transform organizationâ€™s account sheets into millions of Naira.